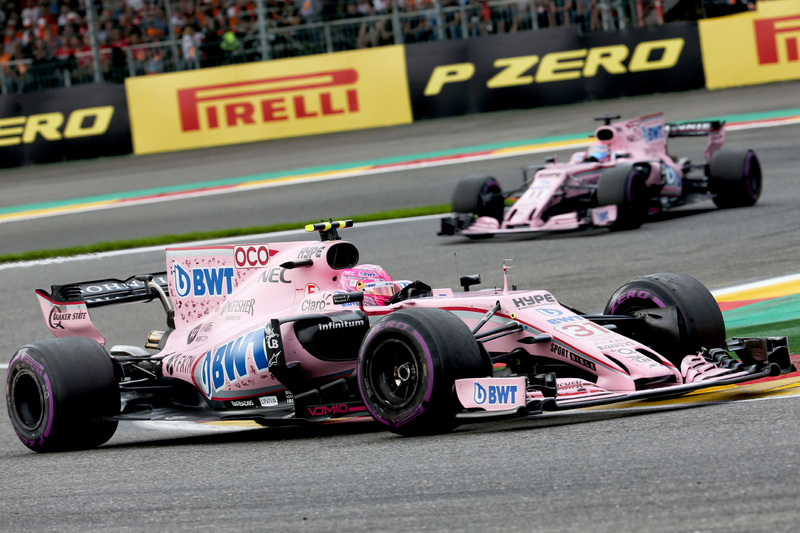 Neither tyres strategy nor possession of the fastest car decided the Belgian Grand Prix; rather, Force India’s Sergio Perez and Esteban Ocon dictated the race’s classification. The pair’s unedifying comings together put paid to what should have been a productive afternoon of points scoring for Force India, and it also triggered the lap-30 safety car that ultimately deprived the race of a strategically varied conclusion that could have offered a different result. Perez and Ocon’s on-track sparring, however, is nothing new — indeed it was merely the boiling over of already simmering tensions that have coloured almost all of the pair’s season. Force India is growing up. A decade ago the team started life under Vijay Mallya as effectively the last-placed team. This year it will almost certainly finish fourth in the constructors standings as the best of the non-race-winning teams. Few dispute that it is the most efficient point-scorer on the grid. But the team’s relative successes have it existing in a sort of motorsport puberty. Having grown into a healthy and sustainable entity, Force India must now navigate the difficulties of adolescence, and what it lacks in raging hormones it makes up for in Perez and Ocon, who are simultaneously fuelling the team’s growth and turning it into a self-destructive wreck. Perez, having rehabilitated his career as Nico Hülkenberg’s teammate after a disastrous 2013 season at McLaren, is again knocking on the door of race-winning teams. But thwarting the resumption of his hot-property status is a lack of available seats. With all major teams bar Renault already satisfied in the medium term with their driver line-ups, Perez is locked out of the market without a natural pathway to the winners circle. Ocon’s career contrasts starkly. A highly rated Mercedes junior with a short history of outstanding performances, the Frenchman’s ascension to a manufacturer team is almost guaranteed. This is not just another typical midfield story — yes, Perez made it to Force India primarily due to his sponsorship portfolio and Ocon due to his affiliation with power unit supplier Mercedes, but both have rapidly blossomed into out-of-the-box competitive number-one-status drivers. With the Force India car often performing at a cut above the midfield, Sergio and Esteban are increasingly finding they have only themselves to race with, making collisions more common and the relationship increasingly hostile. Chief operating officer Otmar Szafnauer sees only one way forward. But the situation may be too far gone for such an edict. Already Perez has ignored team orders in Canada when leading an obviously faster Ocon, and Esteban too has compromised Sergio’s race when he bottled him up at Silverstone. So too have the drivers been warned explicitly against risking their cars when racing each other after their calamitous crash in Azerbaijan, in hindsight, deprived them of the chance to take the team’s first ever race victory. “We’ve given them the latitude to race … but we told them if a Baku-type incident happens again, we’ll be calling races from the pit wall in the future,” Szafnauer concluded. Red Bull Racing at the turn of the decade makes for an interesting parallel. Then the midfield RBR transitioned to the front, but two similarly competitive drivers in 2010 created a season of difficult flashpoints. When free-to-race rules proved unworkable — notably after the 2010 Turkish Grand Prix — the team would later turn to employing team orders, but this too proved fraught, as evidenced by the 2013 Malaysian Grand Prix. The relationship proved untenable, and Webber retired from Formula One at the end of that season. Vettel left the team one year later, notably after bristling at the idea of being asked to move aside for younger teammate Daniel Ricciardo in various races, and Red Bull Racing is once again facing the prospect of a difficult intra-team rivalry, this time between Ricciardo and Max Verstappen. Relations remain friendly for now, but the pair’s coming together in Hungary illustrated how quickly the heat of victory contention can roil tensions. Team orders, put simply, cannot work when two drivers of equal calibre are competing for the same results. Ferrari and Mercedes, for example, are deliberately deploying driver line-ups that balance competitiveness with stability. A team like Force India — on the cusp of podium finishes, and with a tweaking of the sport’s economic framework perhaps a genuine race-winning force — is learning the lesson that two equally ambitious and equally talented drivers cannot coexist. Team orders is a temporary solution at best; only one of Sergio Perez and Esteban Ocon can lead the team into the coming seasons.